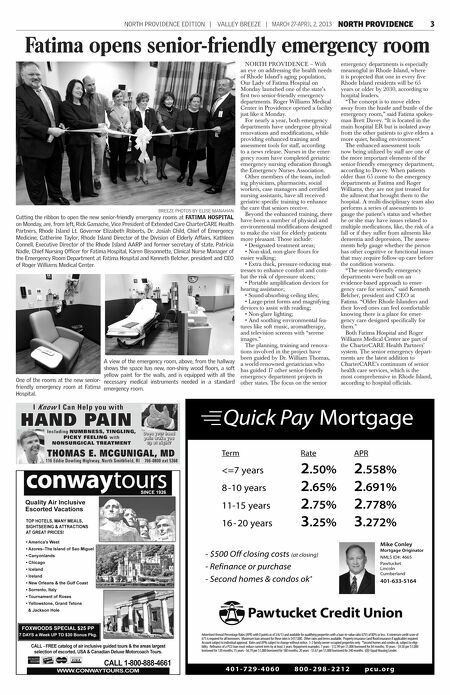 north providence edition | valley breeze | MARCH 27-APRIL 2, 2013 NORTH PROVIDENCE 3 Fatima opens senior-friendly emergency room NORTH PROVIDENCE ��� With an eye on addressing the health needs of Rhode Island���s aging population, Our Lady of Fatima Hospital on Monday launched one of the state���s first two senior-friendly emergency departments. Roger Williams Medical Center in Providence opened a facility just like it Monday. For nearly a year, both emergency departments have undergone physical renovations and modifications, while providing enhanced training and assessment tools for staff, according to a news release. Nurses in the emergency room have completed geriatric emergency nursing education through the Emergency Nurses Association. Other members of the team, including physicians, pharmacists, social workers, case managers and certified nursing assistants, have all received geriatric-specific training to enhance the care that seniors receive. Breeze photoS by Elise Manahan Beyond the enhanced training, there Cutting the ribbon to open the new senior-friendly emergency rooms at Fatima Hospital have been a number of physical and on Monday, are, from left, Rick Gamache, Vice President of Extended Care CharterCARE Health environmental modifications designed Partners, Rhode Island Lt. Governor Elizabeth Roberts, Dr. Josiah Child, Chief of Emergency to make the visit for elderly patients Medicine, Catherine Taylor, Rhode Island Director of the Division of Elderly Affairs, Kathleen more pleasant. 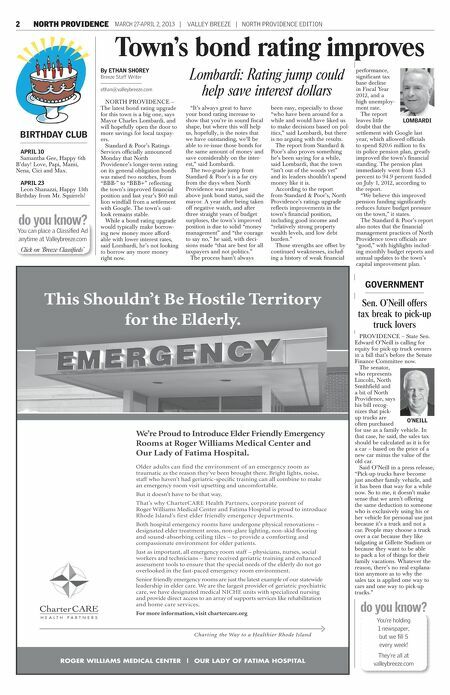 Those include: Connell, Executive Director of the Rhode Island AARP and former secretary of state, Patricia ��� Designated treatment areas; Nadle, Chief Nursing Officer for Fatima Hospital, Karen Bissonnette, Clinical Nurse Manager of ��� Non-skid, non-glare floors for the Emergency Room Department at Fatima Hospital and Kenneth Belcher, president and CEO easier walking; ��� Extra thick, pressure-reducing matof Roger Williams Medical Center. tresses to enhance comfort and combat the risk of dpressure ulcers; ��� Portable amplification devices for hearing assistance; ��� Sound-absorbing ceiling tiles; ��� Large-print forms and magnifying devices to assist with reading; ��� Non-glare lighting; ��� And soothing environmental features like soft music, aromatherapy, and television screens with ���serene images.��� The planning, training and renovations involved in the project have been guided by Dr. William Thomas, A view of the emergency room, above, from the hallway a world-renowned geriatrician who shows the space has new, non-shiny wood floors, a soft has guided 17 other senior-friendly yellow paint for the walls, and is equipped with all the emergency department projects in One of the rooms at the new senior- necessary medical instruments needed in a standard other states. The focus on the senior friendly emergency room at Fatima emergency room. Hospital. I Know I Can Help you with HAND PAIN Including NUMBNESS, TINGLING, PICKY FEELING with NONSURGICAL TREATMENT Does your hand pain wake you up at night? THOMAS E. MCGUNIGAL, MD 116 Eddie Dowling Highway, North Smithfield, RI 766-0800 ext 5368 emergency departments is especially meaningful in Rhode Island, where it is projected that one in every five Rhode Island residents will be 65 years or older by 2030, according to hospital leaders. ���The concept is to move elders away from the hustle and bustle of the emergency room,��� said Fatima spokesman Brett Davey. ���It is located in the main hospital ER but is isolated away from the other patients to give elders a more quiet, healing environment.��� The enhanced assessment tools now being utilized by staff are one of the more important elements of the senior-friendly emergency department, according to Davey. When patients older than 65 come to the emergency departments at Fatima and Roger Williams, they are not just treated for the ailment that brought them to the hospital. A multi-disciplinary team also performs a series of assessments to gauge the patient���s status and whether he or she may have issues related to multiple medications, like, the risk of a fall or if they suffer from ailments like dementia and depression. The assessments help gauge whether the person has other cognitive or functional issues that may require follow-up care before the condition worsens. ���The senior-friendly emergency departments were built on an evidence-based approach to emergency care for seniors,��� said Kenneth Belcher, president and CEO at Fatima. ���Older Rhode Islanders and their loved ones can feel comfortable knowing there is a place for emergency care designed specifically for them.��� Both Fatima Hospital and Roger Williams Medical Center are part of the CharterCARE Health Partners��� system. The senior emergency departments are the latest addition to CharterCARE���s continuum of senior health care services, which is the most comprehensive in Rhode Island, according to hospital officials.